Yesterday evening I flew into Accra again, this time accompanied by Marina and two of her colleagues. They departed onwards to Tamale this morning, going to conduct a first 'train-the-trainers' course on the topic of emergency obstetrics for midwives in a new hospital there. Should be an interesting and fun week, not only due to the subject matter, but also since there is good rapport between the three of them. I will be staying in Accra, helping with another training, on the topics of e-scrap disassembly, health, safety and evironment, etc. This training will be conducted by two persons from Datec Technologies, which is a partner in this NCF-funded project. Should be an interesting week too! Today is Quintin's birthday, and he will arrive from Newmont's Ahafo gold mine during Tuesday afternoon, so we will have time to share an evening and a meal, etc., together. Unfortunately Marina can't be here too, but so it goes. In the past I have missed out on some of his birthdays, due to being away on work, or grounded in Uganda by European volcanic ash clouds, etc. So now it is Marina's time to miss out. By the 19th, Quintin will have departed for a mining camp in northeastern Burkina Faso, which he will manage for All Terrain Services (ATS). On Saturday Marina and her colleagues will be back and we hope to see some old friends in Accra during the day. We fly back to Amsterdam late that evening. One of my colleagues on the current mission to Colombia, is Steve Fraser from The Airshed, here accompanied by two stylish colleagues working with the Contraloria General de la Republica. The umbrella is to ward of the sun at an altitude of some 2,500m , as is the snazzy hat worn by the "dust-man". Here is a view of the partially-rehabilitated and -vegetated gravel and sand mining site. Doesn't look too bad, so near to the offices of the environmental department. In fairness, they were doing as good a job as possible, I think. Two colleagues from the Contraloria overlooking the mining faces of this gravel and sand mining site, as well as the nursery below. The sites' environmental engineer pointing out well-preserved rock paintings by the Chipcha's, original inhabitants of the area. Measuring water quality with Contraloria staff. Stripes with compliments of an old camera. Illegal lead smelter (for recycling car batteries, etc.) right next door to the legal mining operation. The smelter looks deserted, since it only operates at night (when control is difficult...). The stream between the quarry and the smelter runs into Soacha, and despote three cyclones, it is presumed that airborne particles and gases move in the same direction, down a narrow valley. Lunch venue after the sites visits. "La Gallina Ardiente" refers to spicy chicken dishes, and not to "hot chicks" as some had suggested. Had an excellent lunch there, in great company too. Some of our lunchtime companions. This was the talking side of the table. This side of the table was more involved with the serious side of lunch - eating. In summary, the pictures should illustrate an enjoyable day outside, and in good company. From a technical point of view, the main message was that operations that have good relationships with the environmental authorities, and try to do a good job, don't look to bad. Even though these were only quarries for building materials, rather beningn from a chemical point of view. The effect on the landscape is pretty obvious, though. On Monday we enjoyed a really good presentation by Steve Fraser (www.theairshed.com), a very practical discussion with examples and case studies from the UK in connection with air quality measurement, etc. One of the training sessions for the Contraloria General de la Republica in Bogota, Colombia, on behalf of IKV Pax Christi. After concluding the working part of the day, we were met with a lot of rain (and a dire shortage of available taxi’s) on the full streets of Bogotá. We waited in vain at a few different spots, and eventually decided to walk towards an area where there would be a better chance of catching a taxi. On the way there, our translator and guide Jan Wybe Oosterkamp had a brilliant flash of inspiration and we walked towards Ricardo’s bookbinding workshop where Jan Wybe usually has his notebooks made for him, by hand. The plan was to have a look at this workshop and get a taxi from there. Once inside, however, we were welcomed profusely, and ushered into a little "museo" with examples of bookbinding, some prints on the wall, and various tools of the trade that could easily have doubled as medieval torture equipment. A selection of chairs and stools were brought in, and we were seated around a little glass table. Shortly thereafter, four Belgian beers (yes, Delirium Tremens..!) were delivered and we certainly enjoyed them! From the Museo we could look into the workshop where half a dozen people were trimming pages, sewing pages together, glueing attractive covers onto books and various other activities. Very good to see true artisans with real skills, making high-quality, unique items. The beers tasted really good and didn't last long, even at 8,5% alcohol. At this point, a bottle of whiskey (labeled "Something Special", let's not guess where it was made...) turned up, as did 4 whiskey glasses. All this hospitality was free and we purchased a couple of hand-made books. Eventually a taxi was called for us and we left, ... reluctantly. A remarkable ending to a great day. Very early Monday morning, and between other project work, I have time for some more extended blogging. Saturday saw me visiting an area with small coal mines near Lenguazaque, North of Bogotá. An excursion along with some colleagues contracted by IKV Pax Christi, as well as employees of the Contraloría General de la República. After a bus ride of a couple of hours into the green countryside, leaving the hectic Bogotá traffic behind us, we detoured briefly through a small, attractive town, with a colonial look. Driving on very narrow streets, with a few 3-point turns, the bus then reached country dirt roads, passing between little farms, featuring lots of cows and some milk-related industries. Mining of coal and construction materials (gravel, etc.) was evident from the mountains surrounding these valleys. We reached Lenguazaque before lunch were welcomed by a friendly police inspector, and took a walk to the river, so that Dr. Robert Moran could demonstrate the use of water quality measuring equipment in the field. This was followed by an excellent lunch in a little local restaurant and some coffee in another establishment around the corner. By now we were all very keen to actually see a mine, and so we piled into our bus and ventured up the mountain on an increasingly deteriorating dirt road. After a couple of exciting moments, we decided to get out and walk the rest of the way, allowing the bus with a lightened load to make its way up. Walking uphill at altitudes of between 2,500 and 3,000m, and after a nice lunch, caused some heavy breathing, but we eventually got our breathing and walking into the right pace and enjoyed the magnificent views of the countryside. Still dominated by farms and cows, but now on steep slopes. By the time we had reached a fork in the road it had started to rain. Hard. Since I was leading the walking group with another foreign colleague, we didn’t know which branch to choose and had to shelter under the eaves of a farmhouse until our other colleagues arrived. I am proud to say that the two of us who were there first, both live at approximately sea level, and we had left our high altitude friends far behind! The smaller bus was more successful at negotiating the steep and twisting roads and allowed us a view over the countryside and over one semi-abandoned little coal mine through misted windows, all accompanied by a running commentary from our policeman-turned-tour guide. We then arrived at the destination, a small mine that was reportedly better at environmental, health and safety issues than most, but where work was suspended. This was not due to any legislation or governance, but caused by a dispute between 5 brothers, an inheritance issue, apparently. All of this was observed in pouring rain and in a thunderstorm. When I pointed out that a group of people sitting in a shed next to an old winder engine, with a steel cable running up to a pulley high above us in the sky, could lead to a lot of excitement if that pulley were to be struck by lightning, there was a rapid exit towards lower (though not any drier) regions. Back in Lenguazaque we were treated to aguardiente-laced coffee, different types of local bread and honey tea in a café, all while enjoying the good company of slowly-drying friends and colleagues. Not a typical day in the field, but a very enjoyable one! Great to have an interested audience! Today I presented talks to a varied selection of professionals from different fields, all employed by or associated with the Contraloria General de la Republica, in Bogota, Colombia. The topic was mining environmental management, and specifically issues in connection with monitoring and inspection. I could base most of my talks on the information gained during the EU-funded "National EIA & SEA Project" in Ghana, that I had the pleasure to lead from 2005 to 2008. Nice to revisit some of those experiences again. And fantastic to have an attentive, interested and even sometimes critical audience! Looking forward to various discussions during the week to come, including visits to some mine sites in the vicinity of Bogota. 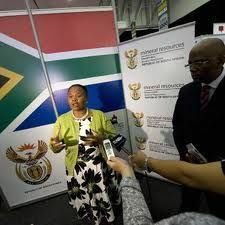 Susan Shabangu, Mineral Resources Minister, today addressed delegates at Mining Indaba held in Cape Town saying that nationalisation is not a viable option. The Minister also said that the ANC has welcomed the report and it's findings and that they will adopt a policy that would benefit the country. The minister also said the state would become increasingly involved in exploration so that new deposits could be discovered to create jobs and replace worked-out mines. The National Treasury will set aside a budget for this." Great to see that nationalising mines is off the table, but the idea that the state should get into exploration, is flawed, due to the following:- Exploration is a risky business, citizens should not carry such risks, they are for companies planning to benefit from exploration successes now and then;- If any particular exploration has any chance of being successful, then the private sector can do it better than the state;- What would the state do with any exploration success? If the state shouldn't own mines, it would need to tender out or auction the property. In any case, it would be competing with mining/exploration companies.- The state would be both player (explorer) and referee (regulator) at the same time. Still a way to go in getting the state out of the way, I see. At the end of a rather hectic week in and around Bogota, I have a few moments free in the El Dorado airport lounge, time to reflect on the new friends and colleagues that I have met here. Yesterday (Saturday) was mostly a touristic day, with a trip out to the little town of Guatavita, and thereafter a drive and walk up to the Laguna del Cacique Guatavita, where the Muisco leader (from before the days of Spanish conquest) would perform a ritual "penetration" of the lake waters (considered to be female), covered in resin, honey and gold dust (considered to be the "seed of the sun"). It was quite a hike, not over particularly challenging paths, but up to an altitude of 3,100m above sea level. I have to admit I was wheezing a bit, but the view and the experience was certainly worth it! The picture shows (left to right) Robert Moran, Robert Goodland, Jan Wybe Oosterkamp, and myself. After this visit, we descended and drove to an old underground salt mine, parts of which are in use as a church for special occasions. We then drove back in the direction of Bogota, and had a very nice barbeque hosted by Mrs. Sandra Morelli, the Contralora (Comproller General) of Colombia. Her house overlooks a lake and we were joined there by a number of her colleagues from the Contraloria. The discussion was very good and I am impressed by the commitment of Mrs. Morelli and her colleagues to help ensure that mining in Colombia should follow clear rules and regulations, and should be subject to various control measures and inspections. This morning our translator Jan Wybe Oosterkamp collected me from my hotel and we took a walk through Bogota towards the bottom end of the Funicular railway up to Monseratte, a point on the mountain overlooking the massive city. We were joined by his wife and two young boys and took the ride to the top. This area was quite full with many visitors, but still provided an excellent view over the city and the mountains. Such a pleasant day, such nice people. Now that the week is just about over, I do hope that we will all meet again, soon, and that I can add the friendships made, to my growing collection of friends from all over the world. I write this towards the end of two hectic but fascinating days in Bogota. Yesterday I participated in a conference about environmental effects of mining trying to share some Ghanaian experiences with Colombians. And this morning I enjoyed a working breakfast organised by Razon Publica (= "public reason") in conjunction with IKV Pax Christi, my client for this week. Along with two experts on mining environmental issues, we answered questions on the environmental and social aspects of mining. Present in the room were fairly vocal people from both ends of the spectrum: anti-mining activists from the cajamarca area (a high and environmentally sensitive area in the Andes) and management persons from a gold mining company currently exploring there. Sometimes it was a challenge to stick to my view that mining is neither good nor bad by definition, but that all costs (including long-term environmental ones) need to be taken into account. My two colleagues here (similarly contracted by IKV Pax Christi) are much more experienced than I am, have seen many more mining projects than I have, and have also visited Colombia before, which I have not. Still, my experiences from Ghana and Uganda, and also my opinions based on those, have been highly appreciated. After the morning session, we were all interviewed for the Razon Publica YouTube channel, and so I must admit that I do hope my views will come out as honest as I expressed them... Time will tell, I guess. This afternoon, while running though the rain to get to a meeting, we encountered a phenomenon I've not seen before: Some sort of traffic officials, wearing reflective gear and carring Stop/Go paddles, who keep an eye on the traffic lights through the lead-laden exhaust gas and wade into the traffic with their paddles to stop traffic when the light turns red, motioning pedestrians across. Whistle in mouth, they discourage the braver types of pedestrians from taking their own chances. The system seemed to work well, a sort of outsourcing of the need to look at traffic lights yourself. Off to an old salt mine (and current cathedral) tomorrow, guests of the Comptroller General's Office. I have now spent 3 days in Bogota, and have been involved in meetings with IKV Pax Christi, the Colombian Comptroller General's Office (la Contraloria), the EU delegation and the Royal Netherlands embassy. Hectic stuff, with lots of more or less simultaneous translations between English and Spanish going on. Tomorrow we participate in a large closed forum to discuss the lack of balance (mining/development vs environmental oversight, etc.) in this country. The challenge is to discuss issues on a very macro level, avoiding details of specific environmental and social problems (of which there are many, and serious examples, here) and helping the Contraloria to gain more influence (power) in the environmental permitting of exploration and mining licences. My own contribution will be to discuss mine decommissioning, closure, environmental financial assurance mechanisms, all against the background of experiences from Ghana. Colombia has a much more complicated situation - think of the complications added by having distinct indigenous populations (generally anti-mining, generally not consulted well in the whole permitting process), the presence of armed rebels, permits already granted over sensitive environmental areas, etc. However, this afternoon, as we stepped out of one meeting, we saw this view from a street in Bogota. Let's believe it is a sign of hope. Earlier this evening I arrived in Bogota, after a day in the capable hands of KLM and Air France. The day hadn't started so great - we got up at 02:45 so that Marina could drive me to the railway station in Eindhoven, to catch the 03:30 train to Schiphol. That worked OK, but then the train was pretty full with a rather loud bunch of youngsters... at 3:30 a.m.! Anyway, some of them apparently caused sufficient damage to the train to result in an unscheduled 50 minute stop at Tilburg, while we all waited for the police to arrive to take them into custody. Tilburg is not that big, there's certainly no traffic at that time of the morning, perhaps the cops had to get out of bed or something. When we finally left Tilburg again, still accompanied by loud co-passengers, we were well behind schedule and there was a real worry that I might miss my flights. But, I'd checked-in online, and so the process to get onto a plane was smooth and really quick. KLM to Paris Charles de Gaulle was really short, hardly time for a coke and a sandwich. Transfer at CDG was remarkably smooth. And then the Air France flight was comfortable, but long... The food served by the friendly crew was pretty good, even if one has to eat it with that elbows-tucked-in, vertical-forearms, praying mantis motion. Then the Bogota "El Dorado" airport was pretty efficient, including the usual Disneyland-type of zig-zag queuing for immigration. I was collected by a new Colombian colleague and driven to the hotel. It was clear that successful driving here requires a decisive person with equal amounts of skill and confidence. Now I'm settled in Hotel Nacion and keen to start my week's assignment with IKV Pax Christi, advising the Colombian Court of Audit on mining environmental issues.